If you are heading out of town, you might want to put a note on your email to let people know where to contact you. Or just to let them know to contact somebody else while you’re away. 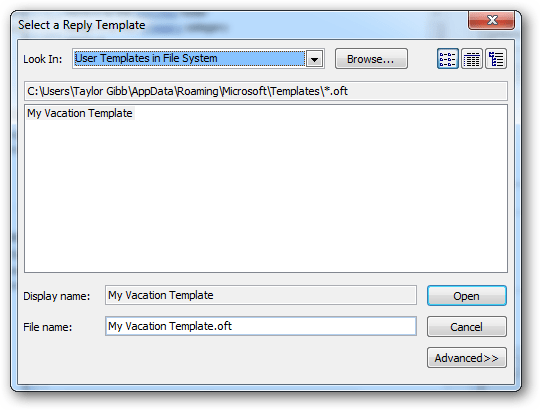 Here’s how to setup a vacation responder for (almost) any email account. Either you have Gmail, Hotmail or Yahoo account that support responders. 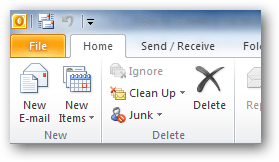 You are connected to a Microsoft Exchange Server and can use the Out Of Office Assistant. You have a legacy POP3/IMAP email account that doesn’t support responders, perhaps from your internet provider or another service. For those of you who have email accounts with one of the 3 major search engines, that is Gmail, Hotmail, or Yahoo – the setup is fairly straight forward, taking only a couple of clicks to get going. For those of you who own an @gmail.com address, or even run a small company that uses Google Apps, the process is only a few clicks long. 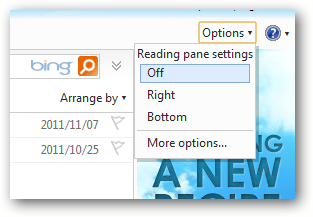 Just click on the settings menu in the top right-hand corner of your screen and select Mail Settings. 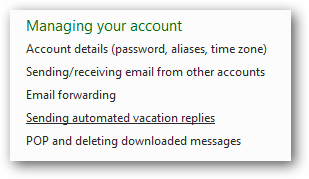 When the mail settings page opens, scroll down until you see a section called vacation responder. The options are very intuitive and creating a vacation responder is very easy. 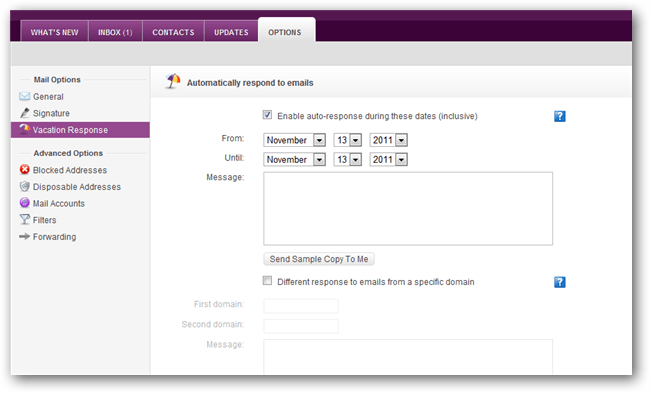 Once you are in your Hotmail inbox, click on the options button on the right-hand side and select the More options link. 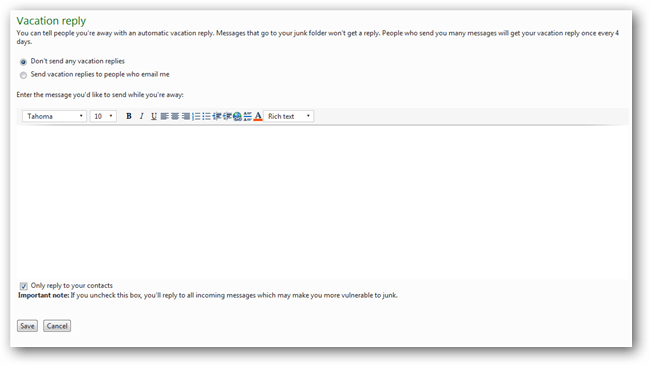 When the Hotmail Options page loads you will want to click on the Sending automated vacation replies link. From here you can easily set up your vacation reply. By default it will only respond to people you have in your contacts so be sure to uncheck the check box if you wish for it to reply to everyone. The vacation response in Yahoo Mail is set up by going to Options on the top of the page and then going to Mail Options. Once there, you will find a tab on the left hand side called Vacation Response, this is where you will need to be. 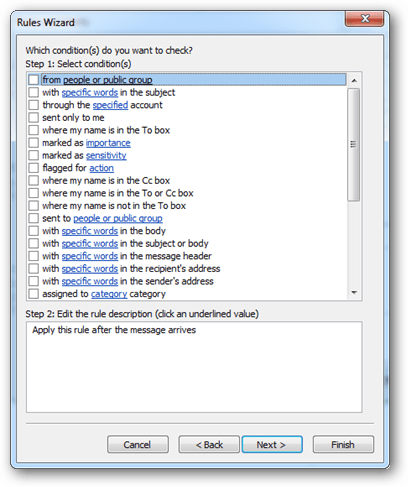 One extra option that the Yahoo Vacation Responder offers is that you can have to different email responses and you can set one based on a domain name rule scheme. Very helpful. 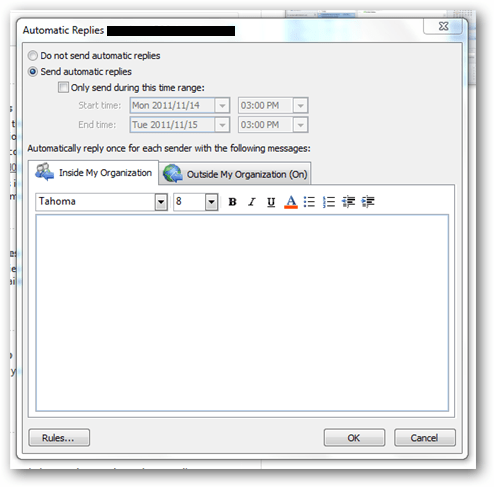 If you are connected to a Microsoft Exchange Server (at your job, usually) you will be able to take advantage of the Out Of Office Assistant, which is the same thing as a Vacation Responder. To set this up hit the office button to enter the backstage view, from here you can choose the Automatic Replies button. From here setting up a vacation responder is pretty easy. If you aren’t connected to an Exchange server at your job, but maybe are using Outlook at home to connect to your local ISP mail, you can check your ISP’s webmail to see if they provide a vacation responder. If not, you will need to leave your PC running with Outlook while you go on vacation. It will also require you to have a email template set up before you proceed. Just keep in mind that if your power cuts off and your PC turns off the emails will stop sending. This will also mean that you will need to have an active internet connection for the duration of your holiday. It’s definitely the last resort option. Click on the Office Button to go into backstage view. Once in backstage view you need to select the email account that you wish to create the for vacation responder for. 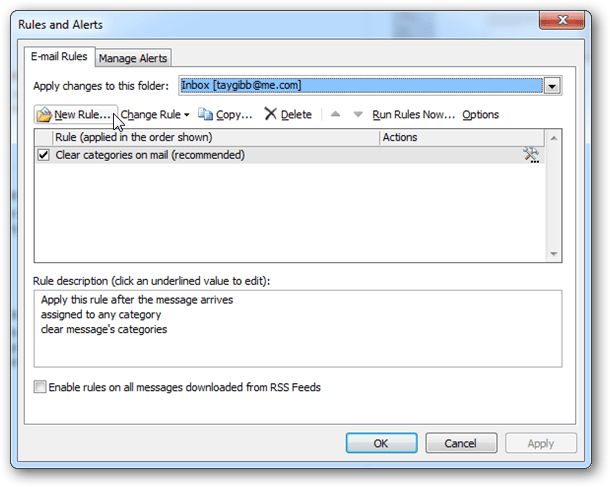 Once you have selected the account, you need to to create a new rule, to do this click on the Rules and Alerts button. 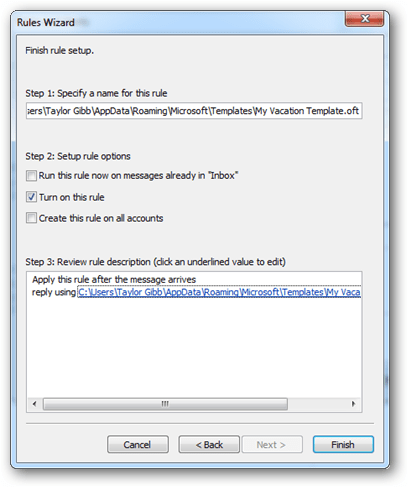 When the Rules and Alerts dialog opens, you need to create a new rule. 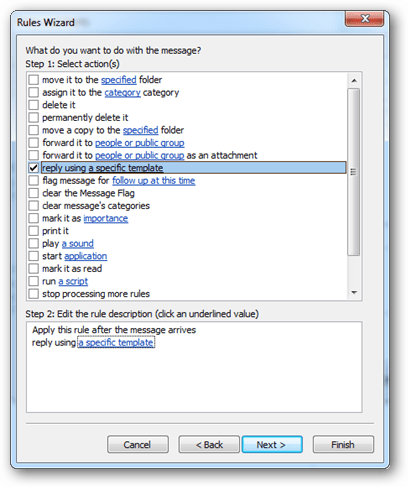 This will kick off the Rules wizard, you will want to choose the option that reads “Apply rule on messages I receive”, then click next. We want the rule to apply to all so we can leave the conditions section blank. 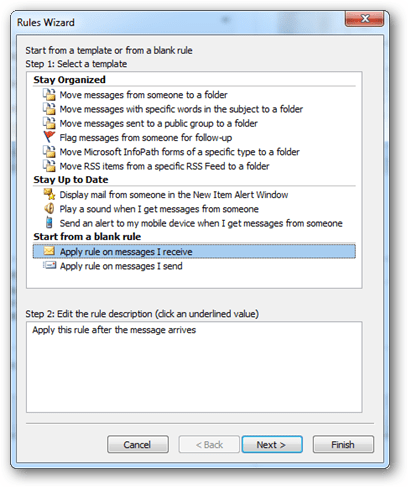 You will be prompted once you click the next button, the message warns that the rule you are creating will be applied to every message that you receive. Just click yes to continue. One the actions page, choose to reply to the message with a template. Click on the specific template underlined word to choose a template that will be used. 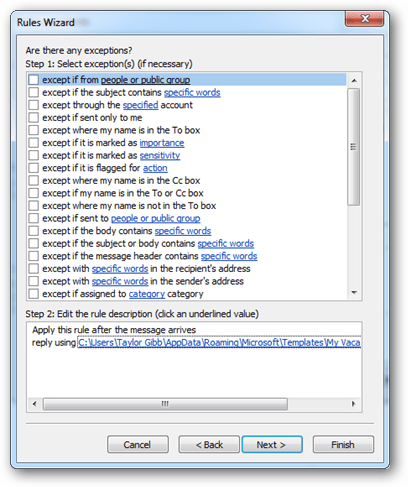 Once your template is chosen and you move to the next dialog, you will be asked if there are any exceptions leave this blank as we want all messages answered. Now click finish to activate the rule. Now when someone sends you an email the template that you selected will be automatically sent to them.